In the DC Comics MMORPG "DC Universe Online" (B's fav game) aside from doing big storyline missions, you can do many little quests like "collections", "investigations", and "briefings", most of which reward you with style tokens or outfit pieces to customize your character. One specific briefing deals with the Big Belly Burger fast food franchise (as seen in many issues of various DC Comics as well as CW's "Arrow" and "Flash" TV shows), in which you search for certain blue exclamation points that give you advertisements for four different offerings from the franchise. One particular ad found in Gotham's Diamond District is for BBB's Bakoshake; a chocolatey, bacon-y milkshake that I couldn't pass up! "Welcome to Big Belly Burger, a LexCorp company. Have a belly-busting day with our new Big Belly Bacoshake! 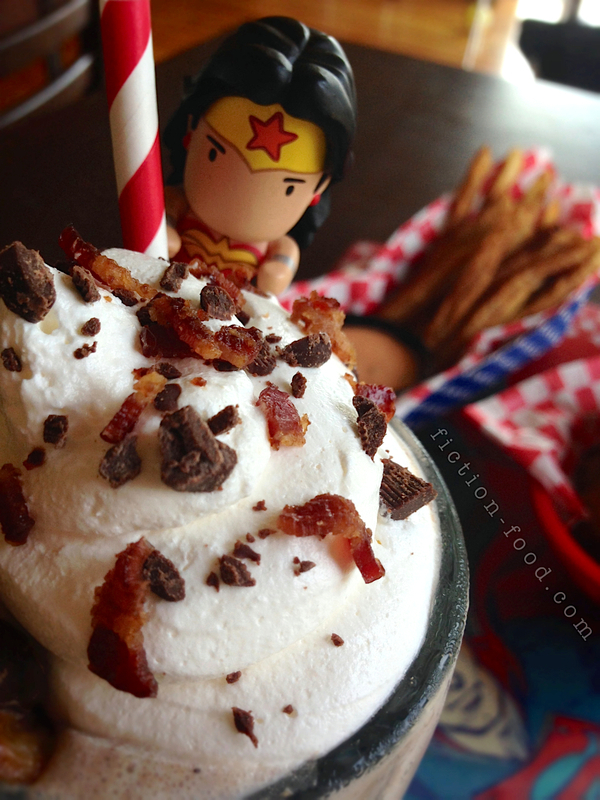 All the delicious flavor of bacon and chocolate in a single cup! May I take your order?" Big Belly Burger is a DC Comics-wide fast food franchise that was inspired by the real-world chain Bob's Big Boy. It originated in Coast City, and can now be found nationwide. It's also a subsidiary of LexCorp, but don't let that worry you. 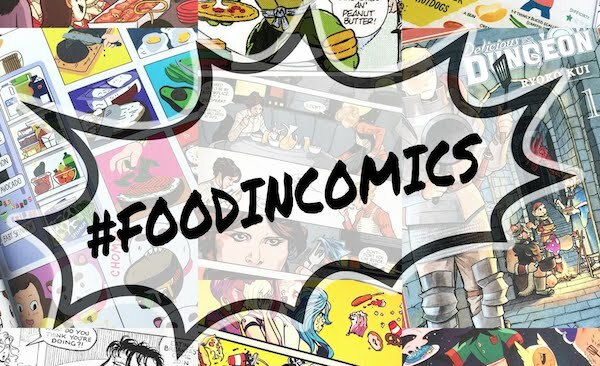 If you watch CW's "Arrow" and/or "Flash" TV series you've probably noticed BBB and its food mentioned/shown several times (each time I get excited like such a dork). And soon we'll have two more DC shows to hopefully highlight the fictional franchise; "Legends of Tomorrow" (CW) and "Supergirl" (ABC)! If you'll be throwing a party for any of these shows, why not to a Big Belly Burger theme and serve these yummy shakes! Be sure to also check out my past post for the Peanutblaster Cookie from the "Big Belly Burger Time" DCU collection! Note: For the recipe below I used vanilla ice cream in the shake with added chocolate chips because I didn't want straight-up chocolate ice cream to overpower the bacon-ness. But please feel free to use chocolate ice cream if you'd like, or even vanilla chocolate chip! Simply omit the 1/4 cup chocolate chips from the blender. 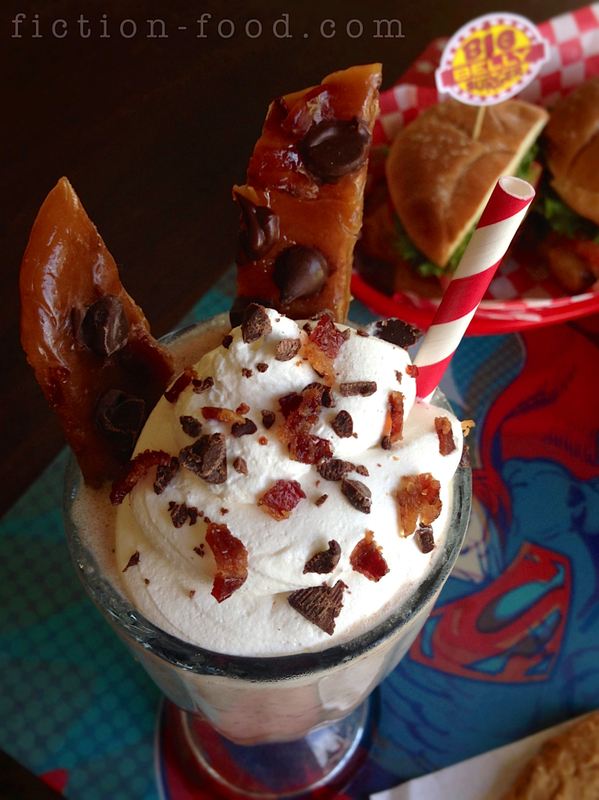 You can also skip putting the sugar-baked bacon into the blender with the milkshake ingredients if you don't want any bits in your shake, just make sure you sprinkle cooked bacon on top and garnish with the bacon toffee! 2. Maple Bacon Toffee: Line a tray with parchment paper & set it aside near your stove. In a small-medium pot over medium heat, combine the maple syrup & butter with the remaining 2 uncooked bacon pieces. A few minutes in, remove 2 Tbsp. of the syrup & set it aside in a little cup to use later. Heat the syrup until very bubbly & the bacon is fully cooked, about 10 minutes. Pour the mixture–with the bacon–onto the parchment-lined tray in rectangle at least 4" x 3" (doesn't have to be exact, can be a little larger) & let cool for a minute or 2. Gently press 1 Tbsp. of the chocolate chips into the toffee & then use a large knife or metal spatula to press-cut the still soft candy into trips about 3/4" - 1" wide. Let cool completely to harden (you can speed this up in the freezer as well) & then simply snap apart where you cut. 3. Making the Shake: Break up 4 of the sugar-baked bacon strips & place the pieces into the blender along with 1/4 cup of the chocolate chips & the reserved 2 Tbsp. of maple-bacon syrup. Add in the ice cream & milk & blend until fully combined & the bacon & chocolate chips are in teeny tiny bits. Pour into your frozen serving glasses. 4. Putting it all together: Scoop some Cool Whip or homemade whipped cream into a plastic sandwich baggie & cut 1 corner into a wide opening. 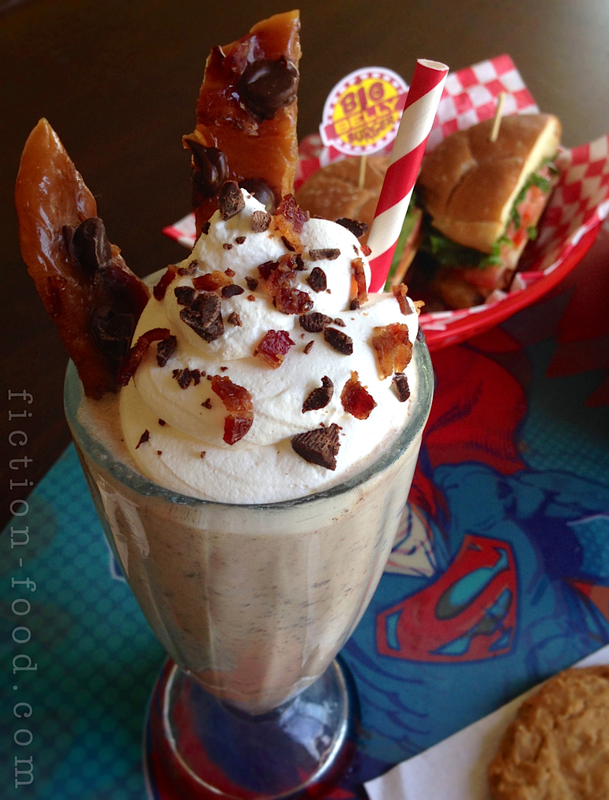 Pipe a generous spiral of whip on top of the milkshake & then position 2 pieces of the maple bacon toffee in the whip to the side. Cut up the remaining piece of sugar-baked bacon along with the remaining 1 Tbsp. of chocolate chips into small pieces & sprinkle on top. Now it's all done! Serve with a wide straw, & a spoon on the side. 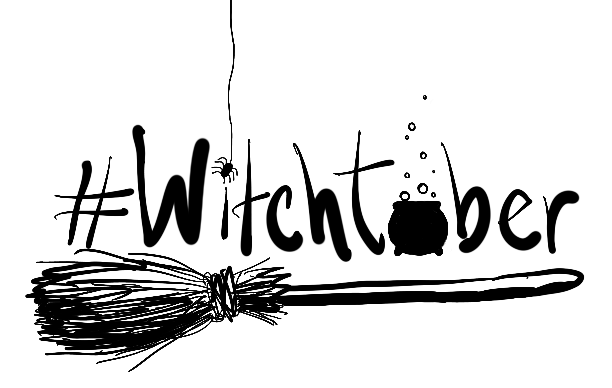 Enjoy & have a belly-bustin' day!